Can the new CAD undermine the positions of its predecessors? From the editors: Two years ago we had luck to interview John Hirschtick, who is well-known in CAD-industry as the founder of SolidWorks. By that time he already left the company he had created, attended a year-long course on modern web-technologies and brought together his old SolidWorks-team for a new project - Onshape. Right now the exciting moment has come when the new CAD development is in beta release. 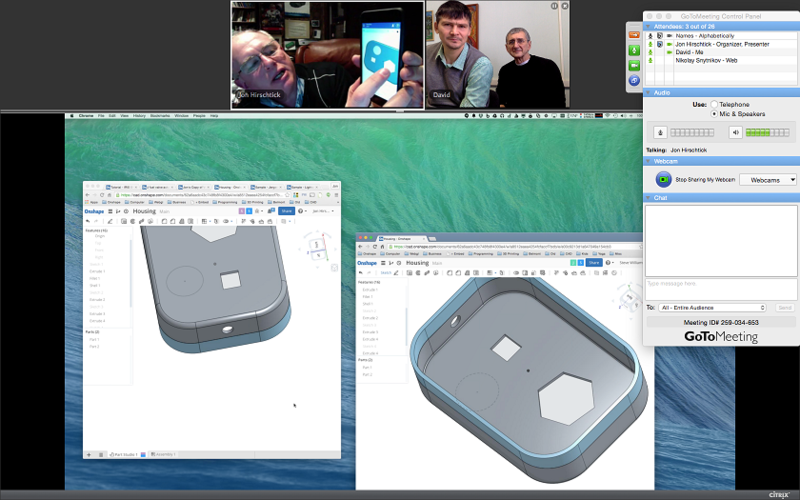 A week earlier John gave a 2-hour presentation for isicad to show Onshape in action. Here is our impressions based on John’s presentation and our own Onshape test-driving. 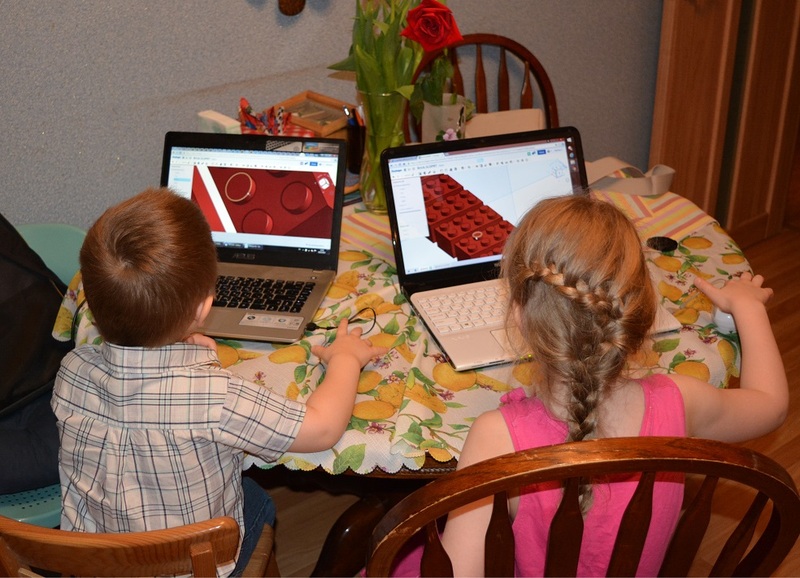 Russian kids are learning how to collaborate with Onshape, working on the same model. They are not afraid to put their data on the servers located somewhere in the USA. Let’s imagine you are a designer finally on the way to a well-deserved vacation and you are waiting at the airport to board the plane that will take you to the southern skies. Your head is still at work, full of thoughts about the latest project and (as usually, a little bit too late) a brilliant engineering idea crosses your mind. All right, you fetch the cell phone out of your pocket, switch on your favorite CAD and with a few subtle hand motions transform your fresh idea into reality. And do it in such a way that your colleagues see all modifications of a 3D model immediately (in real time), understand the stroke of genius and with the tears of joy send their thank-you and air-kissing. Then you enjoy the sea and the beaches somewhere in Spain, Thailand or Sochi with a gratifying feeling of fulfillment. Right now this scenario seems exotic and artificial. Plenty of arguments can be raised why it does not match the real working processes. On the other hand, it does not mean that today’s fairy tale cannot become a routine reality tomorrow, with arrival of a new generation of engineers who are brought up on smartphones and drafted their course papers in Google Docs. The most important thing is that with release of Onshape, a cloud 3D MCAD, the market has a tool enabling true cloud, design on mobile phones and real-time collaboration. It would be pretty naïve to think that highly competitive and conservative CAD industry, marked with half-a-century history of successful relations with engineers can be shaken with just another modeling program for browsers or phones. To find its position in the decades-established ecosystem, a new CAD should successfully solve the most pressing user problems that other tools have not been able to overcome so far. According to John Hirschtick, Onshape founder, such problems that engineers and CAD-managers are constantly talking about, include CAD control of files and their versions. License servers, PDM servers, various file versions, loading, blocking, searching the latest modified version and changes fusion – all this is a big headache in the CAD world. Therefore, Onshape philosophy is built up on the idea of radically simplifying version control to enable a distributed team of engineers working in truly efficient collaboration. Onshape is a true cloud CAD. Nothing required to be installed on a computer except for a web browser with support of WebGL (like Chrome or Firefox). No special server, no special Internet connection, just a regular WiFi. You can log in as easily as in Google Docs, just with e-mail and a password. Onshape also can work from iOS and Android phones and tablets with a special app. iOS version can already be downloaded from Apple Store and Android app will be generally available in the near future. Particularly due to cloud architecture, these apps are not just viewers but fully-featured CAD with 3D model editing, version and notification control, powered by the same advanced 3D modeling technologies at the server side as the browser version. John Hirschtick admits that it is not yet clear whether these apps will be eagerly sought, but his team has taken a risk and invested a lot in developing mobile and tablet apps. Several years ago no one could imagine that most of e-mails would be sent using phones. Something like this can also happen with CAD systems. Another advantage of the cloud is confidentiality and security. John explains that Onshape is more secure than 99% of all desktop systems. The risk for an engineer and a company is not in putting data in the cloud on Amazon servers (where Onshape is currently hosted) or some other cloud provider. The risk is to use USB drives and e-mails to exchange CAD files between desktop systems (not even speaking about such things like hardware failure or human factor, for instance, when your children carelessly play around with your laptop). Some people believe in cloud confidentiality and security and some don’t. Nevertheless, many serious businesses trust cloud and are moving to the cloud. So Onshape is for them. Certainly, people in defense industry could have issues with using cloud systems. 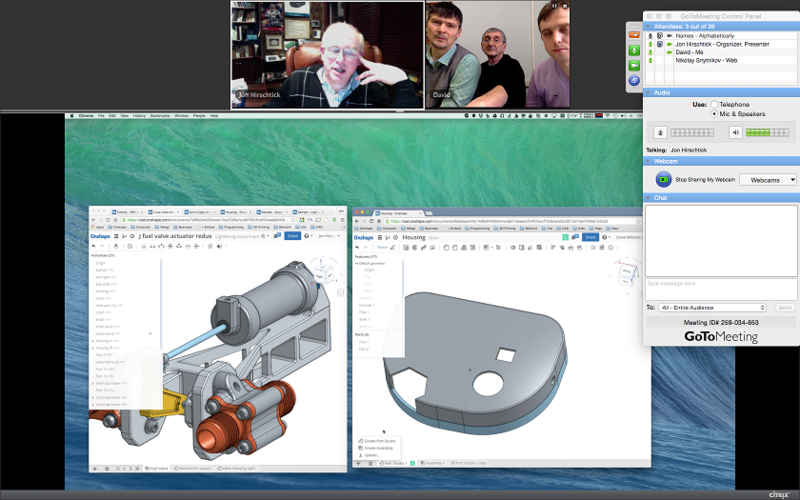 Each Onshape user in any place across the globe works on the same Onshape version. No offline version and no private could (on own servers) exist. John asserts firmly: “If someone needs those things [offline and private], then go and buy someone else’s CAD system”. Onshape already has a web API and there are some companies, which approached Onshape and currently are experimenting with additional apps, like rendering, CAM, etc. The architecture of the Onshape system is pretty different from traditional CAD. In a traditional CAD system you work with files. You can write them to your desktop and then you have to worry about version control if you share them. (Perhaps, only DS 3DExperience is an exception: in CATIA V6 all data are stored in ENOVIA). There are no files in Onshape. There is nothing like this on your desktop computer and you don’t have to work with files in cloud at all. You work with compound documents which are stored in the cloud as database entities. These documents may consist of a part, assembly, G-Code, photo, whatever. They were specially made to look as files, but they are not. Of course, it’s possible to upload a CAD file in some popular formats (ACIS, Parasolid, STEP, SolidWorks, CATIA, NX, etc); you can translate it to the model in Onshape system and download as a file (in STEP, IGES, Parasolid, ACIS). One of the most impressive Onshape features is a possibility to simultaneously modify a model (part, assembly or sketch) by several people. It is done similarly to editing documents in Google Docs when a user can see in real time what changes are made by other users. 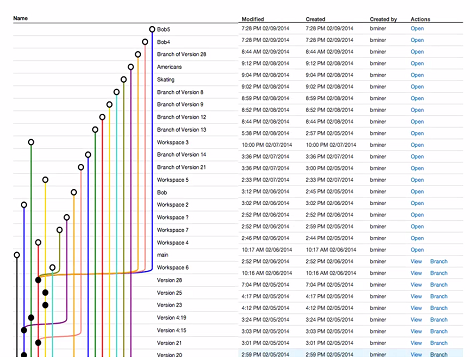 This is how a scenario for working with versions and branches for the same model can look. Onshape developers talked to some people in Google who explained that humans are really great in collaboration if you give them cues. People copy behavior when they see what others do. The key scenario of simultaneous modification is collaborative work on assembly – it is going to be very simple but pretty amazing. For instance, open assembly and start drilling holes in different places. It is also possible to make a branch (copy) of a document to work on it in parallel and then merge the modifications. Onshape system captures every step in collaboration and in history. There is no “Save” button, because everything is saved, so you can “Undo” whenever you want. You can create versions and branches of a document. There is no need to deploy a third-party PDM system with Onshape. A more realistic scenario can be using a third-party PLM system for business processes: when you make modeling changes you use Onshape, and when the modeling work is over you will take a file in Parasolid, or SolidWorks format and put it in the downstream PLM system (can be done automatically by writing a program). Cloud, mobile and collaboration are great things, but they have no value for engineers without standard and powerful 3D MCAD tools. And here we can see that Onshape system was created by CAD professionals with decades of industrial experience in CAD. John Hirschtick demonstrates kinematics of an assembly created in Onshape. Onshape now has 2D Sketcher with 2D constraints, 3D Part and Assembly Design with 3D Constraints, 3D Kinematics, Direct Modeling, etc. Performance of the 2D/3D modeling in web browser is impressive: it is hardly slower than a typical desktop CAD. It is evident that Onshape developers invested a lot of efforts in graphics pipeline and WebGL rendering as well as data transfer features to avoid latency. A striking result is an interactive real time object movement that keeps constraints and mates both in 2D and 3D. It’s hard to make complex things simple, but Onshape team did their best for User Interface to be clean and intuitive. Onshape website also contains dozens of educational videos and plenty of public 3D models. Interestingly, Jon Hirschtick is concerned not with lack of interest to the product but high expectations by potential users. Until now Onshape marketing strategy has been to keep the expectations low, don't talk big, deliver more and make sure the product has excellent capabilities. So it’s good when people start to compare Onshape MCAD functionalities with SW and Pro/E, it means they understand which part of world Onshape wants to be in. Anyway, Onshape developers still have a lot to work on. Some 3D modeling functions like lofting, or free-form shapes are still missing. So for beta-version release Onshape team didn’t finish their job and is not even close to finishing it. “If we talk again in the next 10 years, we will still have a lot of work”, predicts John. The Onshape team consists of 45+ engineers & product managers, 10 marketing & sales persons, the management and a couple of dozens of interns. The Onshape founders worked really hard to hire all those guys in less than 2 years. Some of the employees were already known to the founders through their work for SW and PTC in Boston area, some of them came to Onshape on their initiative. Onshape user interface (courtesy of Onshape). Currently Onshape system is available as a free version and a paid version (the preliminary price is 100 USD per month, that is much cheaper than a bulk of desktop CADs). The free version allows to open five private active documents and doesn’t impose any restrictions on 3D modeling functionality, collaboration, saving, translation, etc. The paid version doesn’t put any restrictions for the number of active documents. However, the payment policies are still in beta and could be changed in future. According to John Hirschtick, Onshape does not have competitors among cloud CAD, since no cloud CAD system with a similar approach and functionalities are available. Some semi-cloud solutions do exist, but they are very different. So the competitors are traditional desktop CADs by SolidWorks, Autodesk, PTC and others. Autodesk Fusion 360 and SolidWorks Conceptual/Industrial Designer indeed perform operations of 3D geometric modeling locally, not at the cloud. While the functionality of earlier created true cloud CADs, like TinkerCAD, are far behind Onshape. Also there are plenty of different desktop and cloud 3D CAD Viewers that may become needless with a free version of Onshape able to open and translate several popular CAD formats. Today, there are more than 1000 Onshape users. Some of them make real products - machinery and industrial things, and some even pay money. Let’s see how the situation will be developing and whether Onshape can follow the triumph of SolidWorks. 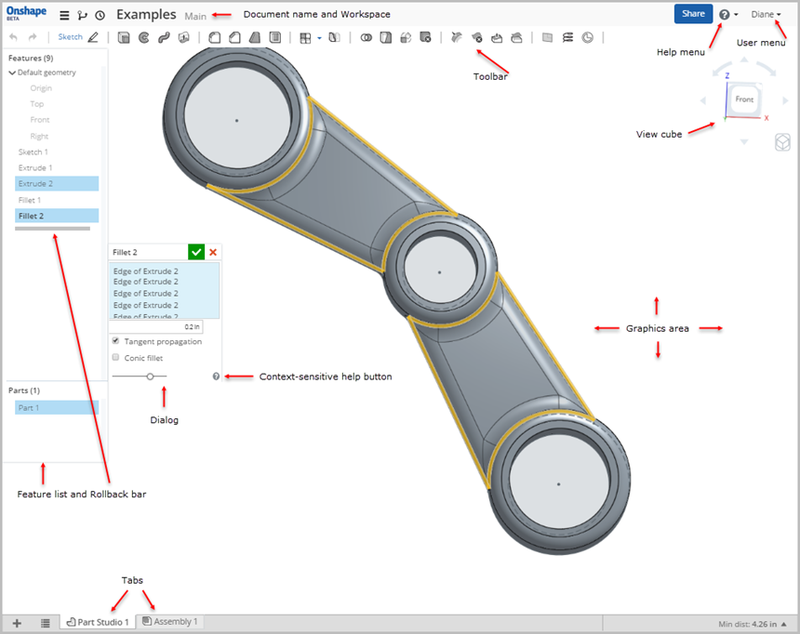 Autodesk Core 1.0: Successor to ShapeManager, or Toy for Enthusiasts?